Teeth are the only part of our body which cannot repair itself on its own. That means it’s you who has to completely take care of them. Though they can be repaired, maintained and even replaced but nothing will be as good as a natural original tooth. 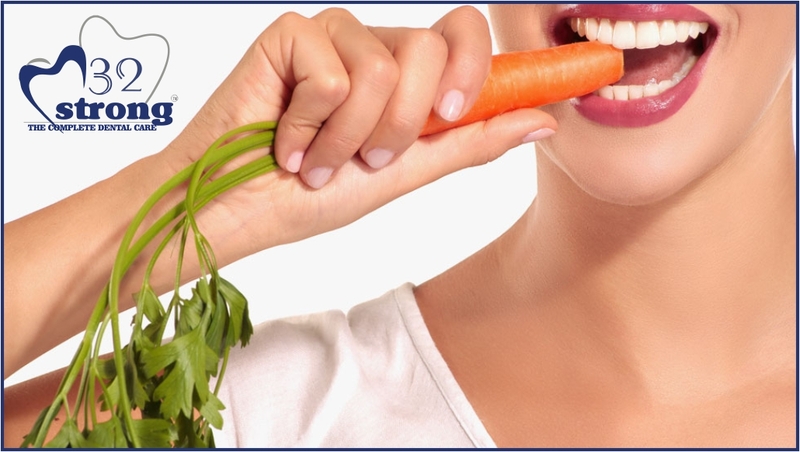 Our diet has a direct relation with the health of our teeth. While some food items can lead to problems like cavity and bad breath, some food items acts like a shield and protect the teeth and gums from any kind of bacteria. Opting a healthy diet will not only help the oral health, but the whole body in general, stronger immunity and hence a better health. A healthy diet includes protein, green leafy vegetables, fruits and unsaturated fats. Calcium: taking adequate amount of calcium is a pre requisite for good oral health. It helps in preventing and even reversing tooth decay. Gum problems and cavities will stay far away from you if take this important nutrient in required amount. Mostly all dairy items like yoghurt, cheese and milk are rich source of calcium. It is also found adequately in broccoli, kale and in fishes like salmon. Vitamin C: vitamin C is a natural immunity booster. It improves body’s ability to fight against bacteria and viruses and repairs the needed tissues. It plays a major role in maintain the overall health of the gums and keeping problems like gingivitis at bay. Lack of this crucial vitamin can lead to problems like inflammation, swelling and bleeding of gums. All citrus fruits like orange; lemon and kiwi are a rich source of vitamin C.
Fruits and vegetables: including a variety of fruits and vegetables in the diet anyway keeps the body healthy but it is especially beneficial for teeth. Eating raw crunchy food like cucumber, apple makes sure that no debris is left stuck anywhere in the teeth and removes almost all of the collected plaque. In short they are nature’s soap for the teeth. Eating these require a lot of chewing which leads to excess production of saliva which in turn has a neutralizing effect on the bacteria. Water: water is life. It is equally important for teeth. Drinking water frequently will wash way all the food particles and plaque from the mouth. Drinking tap water is even more beneficial as it is an excellent source of fluoride, which boosts the quality and health of the teeth enamel. Tea: while drinking normal tea and coffee can lead to yellowing of the teeth, opting for black tea or peppermint makes sure that all the plaque forming bacteria is killed and your teeth are free from cavities and any kind of gum diseases. While all the above mentioned food items will make sure that your teeth are healthy shiny which will give a big boost to your confidence and beauty of the smile. Food items that are rich in sugar and salt like potato chips and gummy candies are the most harmful for teeth. They easily get stuck in the nook and corner of the mouth leading to tooth decay and cavities. Also avoid soda, as it is high in acid content which causes considerable damage to the enamel on teeth which in turn weakens them considerably. Eating junk food which is high in sugar and salt. Make rinsing your mouth after every meal a habit. Visit the dentist at least 2 times in a year. Using a brush that is comfortable on the hands and mouth. Using the proper brushing techniques. Brushing at least twice in a day, if possible after every meal with fluoride rich toothpaste.